Former Ocean Meadows golf course is slowing transforming itself into an open space area. 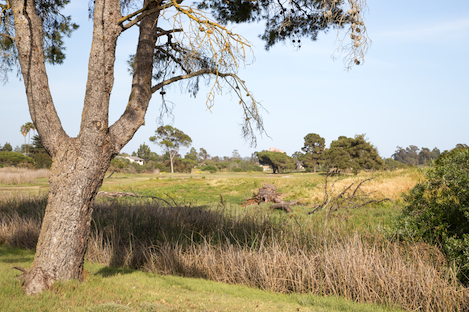 UCSB is currently working with the Trust for Public Land (TPL) to determine the most desirable way to restore the former Ocean Meadows Golf Course to its natural state. According to the TPL, what had been a historic wetland was filled in with over 1 million cubic yards of soil in 1965 to create the 9-hole Ocean Meadows Golf Course. Nearly a half-century later, thanks to $7 million in grant funding that allowed TPL to purchase the 64 acre property, the planning phase for the restoration project is nearly complete. This past Thursday, May 29, UCSB and TPL staff members completed the last of four community meetings, to gather community input on three design options, all designed to feature natural open space, trails, and boardwalks for public access and passive recreation while also providing for restoration and preservation of wetlands and other habitat along Devereux Creek. Conceptually titled the ecology, education and natural recreation options, each provides a slightly different emphasis on balancing the goals of protecting the resources, serving as an educational center and allowing recreational use of the open space. For more information about the planning process and to provide your own input, head over to the North Campus Open Space website (http://www.openspace.vcadmin.ucsb.edu). You’ll find an overview of the restoration project, FAQs, detailed maps of each of the three concept designs and an online survey you can use to provide your input on how the plan should be implemented.